Halloween Mont Blanc Cakes is the first post I’m updating as Halloween is just around the corner. 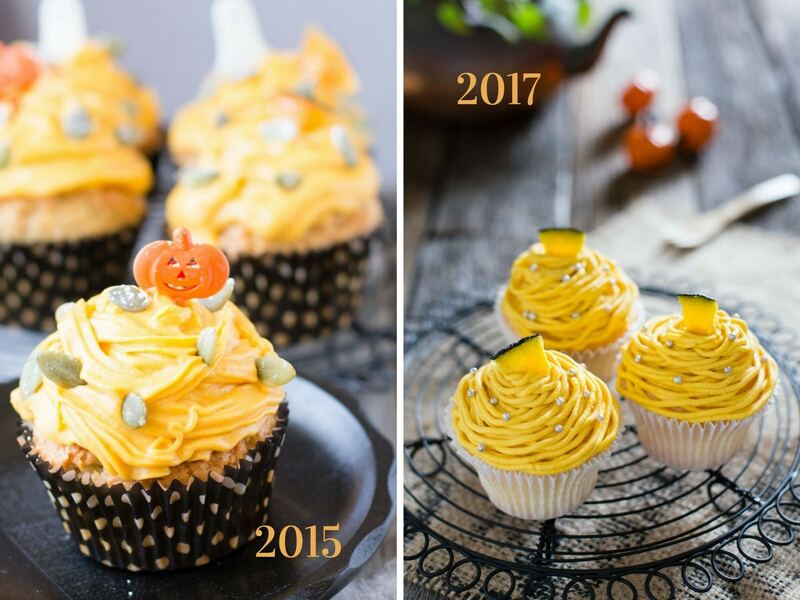 I originally posted this as a Halloween Muffin recipe two years ago, however I think that this more of a cupcake style recipe. Also I noticed in reviewing these older posts, just how much I have improved in both my cooking and photography skills. 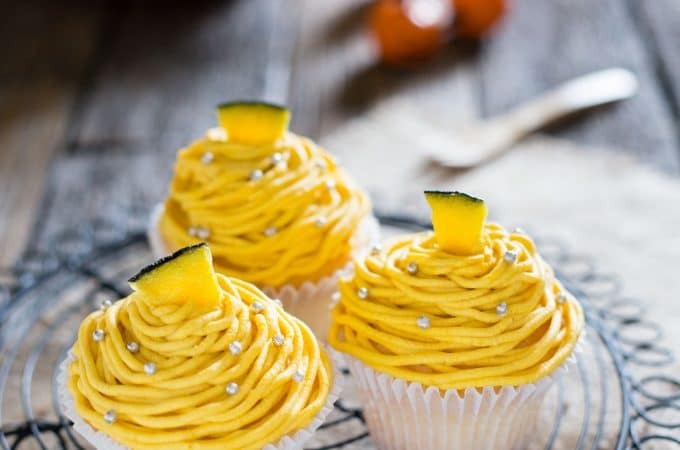 Are you looking for a sweet Halloween treat to bring to a party? Maybe you just want to indulge a little bit this holiday? Then why not try this classic Japanese dessert, with a fun twist? 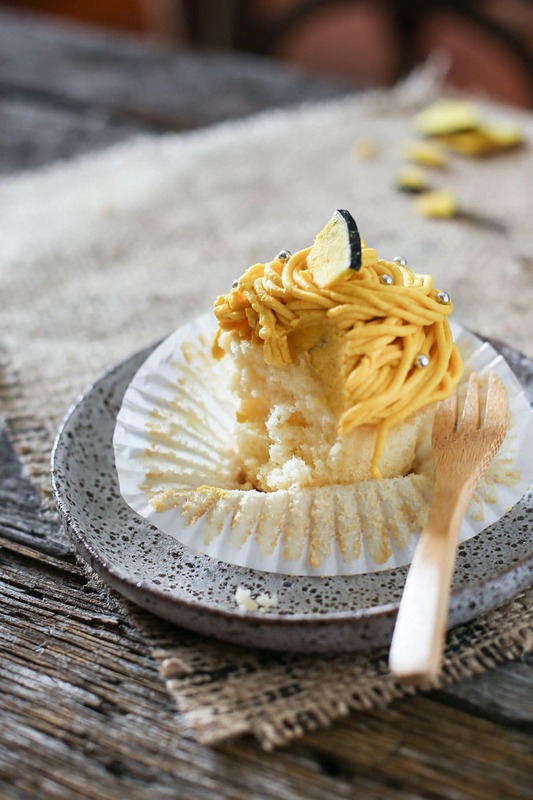 I promise you, these Halloween Mont Blanc Cakes are just the thing you are looking for! These Mont Blanc Cakes are fluffy, sweet, and so delicious! 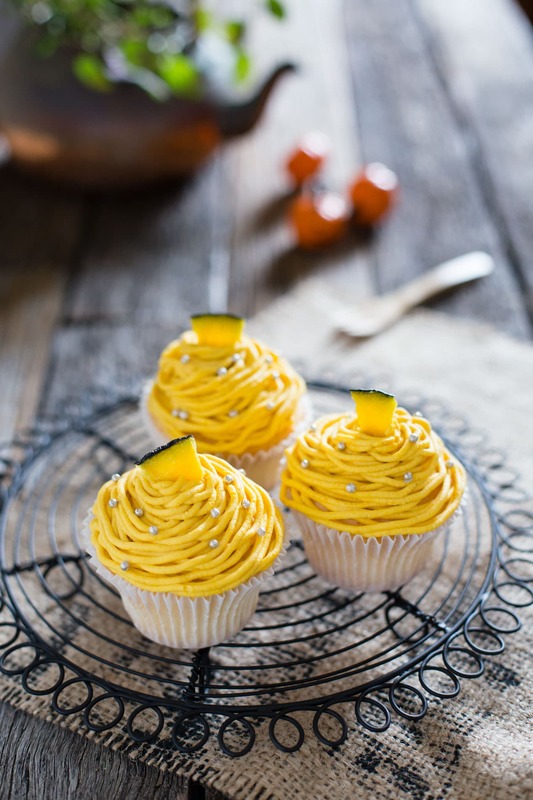 In keeping with the classic flavour of Halloween, I have adorned them with a gorgeous pumpkin Mont Blanc cream! Mont Blanc cake is a very popular Japanese sweet, which is usually made with chestnuts and cream. Since Halloween is first approaching, I decided to make the Mont Blanc Cakes substituting the traditional Japanese chestnuts, for pumpkin and cream instead. The chestnuts are usually sweetened, pureed, then swirled to form a mountain peak-like shape. These frosty peaks are why they are called Mont Blanc Cakes, because they resemble the glistening white mountain peak of Mont Blanc, the highest mountain in Western Europe. I did not have a piping nozzle for the Mont Blanc decoration in my original post, and looking back at the old photos, the effect just wasn’t right. It reminded me of these “nailed it” photos; falling far short of my expectations. To get the traditional Mont Blanc effect, you really need to use a special piping nozzle. 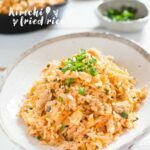 So I didn’t have a repeat of last time, for this revised recipe I made sure I ordered one online! The Mont Blanc Cakes are fluffy and moist, and taste especially delicious when they’re warm and fresh out of the oven, so I would recommend eating one straight away! But for the others, you’ll need to leave them to cool down for a bit before you put the Mont Blanc topping on. Finish the cakes off with either pepitas, Halloween decorations, or pumpkin chips like I did. 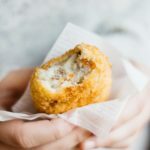 Then you can serve them for guests at your Halloween party, or just eat them yourself at home because they’re so yummy (because you might not even want to share them)! If you are a food blogger like me and would like to improve your photography skills without upgrading your equipment or attending photography course, I truly recommend purchasing “The Food Photography Book” by Nagi Maehashi. First, make the pumpkin cream (for the cupcake topping and part of the filling). Peel the skin off the pumpkin, chop it into smaller portions, then boil or microwave it till it's soft (about 5-6 minutes). Mash the cooked pumpkin then puree it through a sieve. Process pureed pumpkin, sugar and cream for about a minute then leave the mixture in the fridge while you make the cakes. In a small bowl of stand mixer, place egg and softened butter (room temperature) and beat until whitish in colour and become creamy. Add the oil and continue beating. Add half the milk and mix. Add the rest of the flour and milk to combine. Line the cupcake moulds of the tray with baking paper. Divide the batter evenly into the lined cupcake tray. Once the cupcakes are done, allow them to cool down completely. 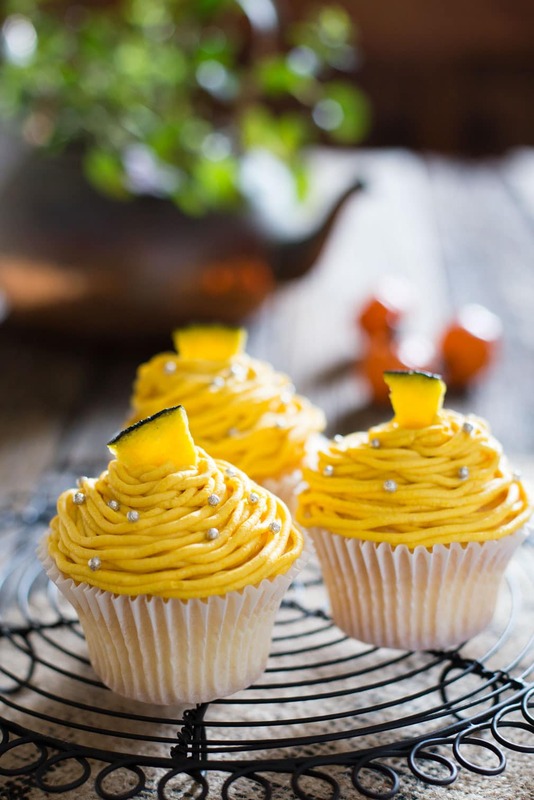 Place the pumpkin cream topping into a piping bag and swirl the mixture on the top of the cakes. 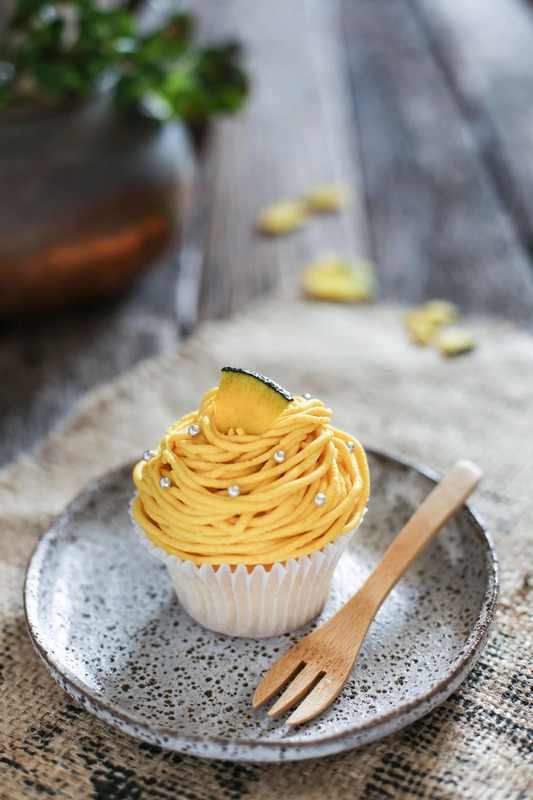 Decorate the Mont Blanc Cakes with pumpkin chips (or anything else you desire). 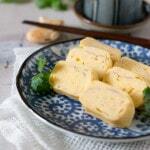 I used frozen Japanese pumpkin called "Kabocha" which meat is quite dense like chestnuts. It is necessary to adjust the amount of heavy cream depends on the pumpkin's texture used. super creative i like it !